Last Independence Day, Alfa Telecom saved its money - for Christmas they went out the other way completely. On the rhythms of "Santa Claus is coming to town" we watch millennials open their gifts in despair. Nothing of what they really want is in those wrapped boxes. And in the song they express their true wish: Alfa Gift. If you are ever near millennials, you'd know they consider the phone as an extension of their arm! 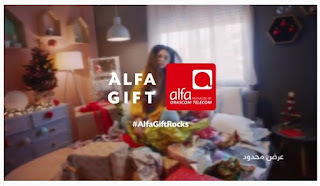 So probably Alfa has the right logic for what they really want this Christmas.